Horror is very subjective thing, and I know there will be things about this book that some horror fans won't like, but Paul Tremblay's Disappearance At Devil's Rock absolutely terrified me. In New England, a teenage boy runs away from his two best friends during a night-time trip to the woods and fails to return. His distraught mother Elizabeth and his younger sister Kate try to piece together the events building up to his disappearance. Are Tommy's loyal friends, Josh and Luis, telling the police the whole story of what happened that night? Why were the boys so obsessed with Split Rock, known in local folklore as Devil's Rock? Are social media reports of a dark figure seen in local gardens at night just urban myths? Who, or what, is leaving pages from Tommy's increasingly disturbing diary in the Sandersons' home? Disappearance At Devil's Rock is one of those books that, like Henry James's The Turn of the Screw, offers a number of potential explanations for the events within it, some of which are supernatural, some of which aren't, and some of which are combination of the two - and yet ensures that every possibility is equally frightening. Some of the story is told in flashback from the points of view of Tommy's friends, and some is told through scraps of Tommy's diary. In combination with the small town, forest setting and the sinister folklore that surrounds the local area, this gives the book something of a Blair Witch Project feel, as if we are viewing found footage that documents a gradual descent into a slowly intensifying danger (this is echoed in Elizabeth's use of a motion-sensor security camera to see what might be happening in her house at night as Tommy's diary pages mysteriously begin to appear). We can see from the outset so many potential horrors to which Tommy is unwittingly going to expose himself, yet we - like his mother and sister as they read his diary - are powerless to step in and stop him, which creates an anxious, ominous atmosphere of gathering danger. Disappearance At Devil's Rock is a horror novel, and a very frightening one at that, but it's also a heartbreaking portrait of a family's torment upon the disappearance of a child. Elizabeth Sanderson's grief, whether we choose to view Tommy's fate in a supernatural context or not, feels almost visceral in its realness. The confusion and loneliness of Kate, the child left behind, is also poignant as her discovery of Tommy's diaries reveals that he was more distant and yet also simultaneously more close to her than she has ever realised. This is a book about family secrets, about grief, about friendship, and about the mysterious ability that some people seem to have to cast a spell - literally or figuratively - over others, as well as the influence of local legends on the collective psyche of a community. It's also about the unbearable fear that comes from knowing one's own fate when it's too late to change it. The manifestation of this fear might be real or it might be imagined, but either way it becomes a powerful and terrifying element of the story. 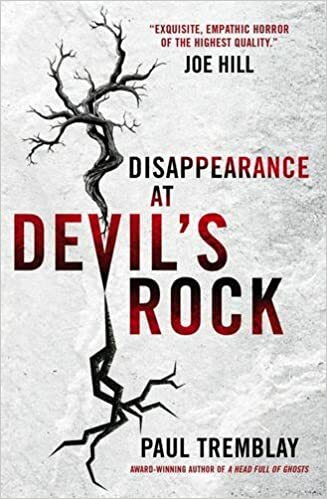 Disappearance At Devil's Rock is the best and most subtly unnerving American horror novel I've read since Josh Malerman's Bird Box, and I recommend it if you're a fan of horror novels that don't stick to an obvious formula or rely on set-piece shocks.